The renovation of the 12,770 SF Learning Center in the basement of the Mike Davis Academic Building has been in the works since 1998, but only recently received the needed funding through a bond issue to allow the project to come about. Since its opening at the end of January 2012, the trendy new Learning Center is already showing an increase in student use from the former, outdated facility. 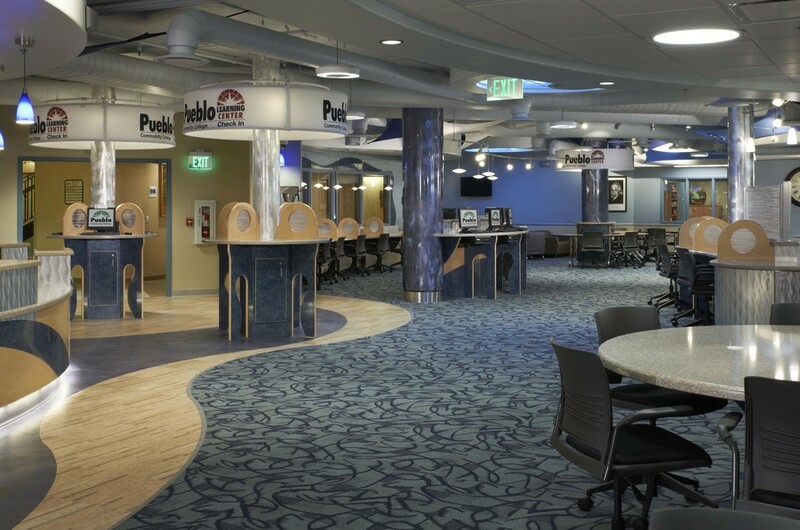 This student hub offers a variety of educational services such as study areas, tutoring classrooms, a cyber-café and laptops the students can check out, in a setting of hip blue-and-silver decor, warm wood accents and a mock skylight. Construction of the Learning Center included minor demolition, framing, and interior finishes, as well as electrical, lighting, data connections, fire protection, plumbing and geothermal heating systems. The new Academic Learning Center is certified LEED Gold. Sustainable Site: Site selection, community connectivity, easy public transportation access, bicycle storage, low-emitting and fuel-efficient vehicles, protect and restore habitat, maximize open space, tress for shade througout site. Water Efficiency: Water efficient landscaping throughout. Energy Efficiency: Improved the building performance rating compared with the baseline building performance rating, did not use refrigerants. Materials & Resources: Reused main interior/nonstructural elements of the existing building. Construction waste management, recycled content, use of regional materials and rapidly renewable materials. Indoor Environmental Quality: Construction IAQ management plan during construction, low-emitting materials (adhesives and sealants, paints and coatings, flooring systems, compoiste wood and agrifiber products) and controllability of lighting systems.